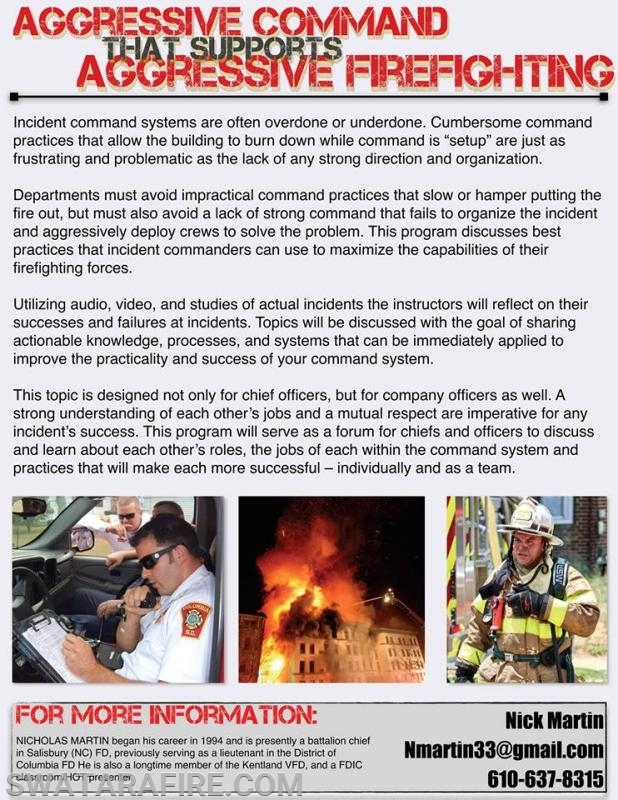 Class Description : Incident command systems are often overdone or underdone. Cumbersome command practices that allow the building to burn down while command is “setup” are just as frustrating and problematic as the lack of any strong direction and organization. Departments must avoid impractical command practices that slow or hamper putting the fire out, but must also avoid a lack of strong command that fails to organize the incident and aggressively deploy crews to solve the problem. This program discusses best practices that incident commanders can use to maximize the capabilities of their firefighting forces. Utilizing audio, video, and studies of actual incidents the instructors will reflect on their successes and failures at incidents. Topics will be discussed with the goal of sharing actionable knowledge, processes, and systems that can be immediately applied to improve the practicality and success of your command system. This topic is designed not only for chief officers, but for company officers as well. A strong understanding of each other’s jobs and a mutual respect are imperative for any incident’s success. This program will serve as a forum for chiefs and officers to discuss and learn about each other’s roles, the jobs of each within the command system and practices that will make each more successful – individually and as a team. • Why does strong command matter? • The effect of poor command officers. • Developing the company officer / chief officer relationship. • Expectations – setting and achieving. • The playbook – balancing policies for standard action without hampering thinking officers. • Pre-arrival, managing the response. • Assuming command & setting up the command post. • The task, tactical, and strategic levels. • Tactical worksheets – tracking companies & actions. • Incident size-up – matching action to conditions. • Divide & conquer – decentralized command. • Managing the incident on conditions and benchmarks. • Controlling incident communications. • Incident safety on the modern fireground.